Lots and lots of painting continues but first I want you to look at the automobile like finish on the enamel in the photo above. I really wish each of you could feel how smooth and see how beautifully the enamel has been applied. This is some serious prep work! Thanks to Omar, Isaiah and Jose! 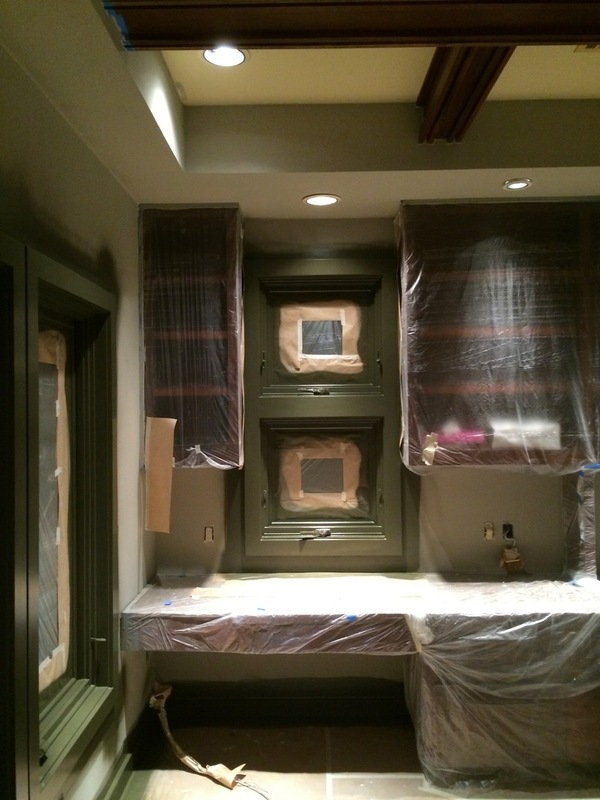 The Kitchen cabinetry is draped and the painting has begun in that area. The Library and Curved Gallery are also enameled. The Library Closet is complete. The trim is not nearly so green as it appears in these iPhone photos. As always, you may click on the images to view full size. Aside from the huge amounts of glass that allow great light into the house, there are several monumentally sized skylights. Of course they require scaffolding for painting and the prep. 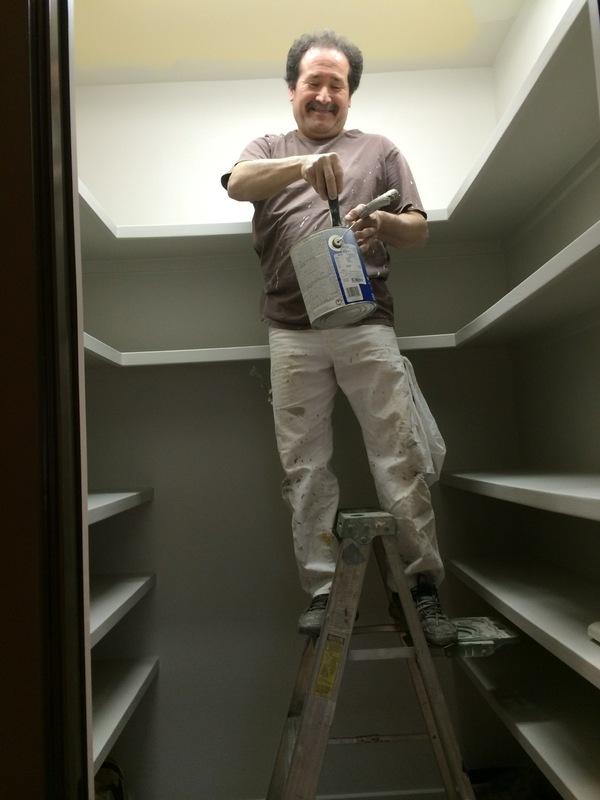 The electricians were here yesterday to complete the installation of additional can lights in the Family Room. The light trims have all been painted to match the ceiling. The new HVAC supply grills will be enameled to match as well. 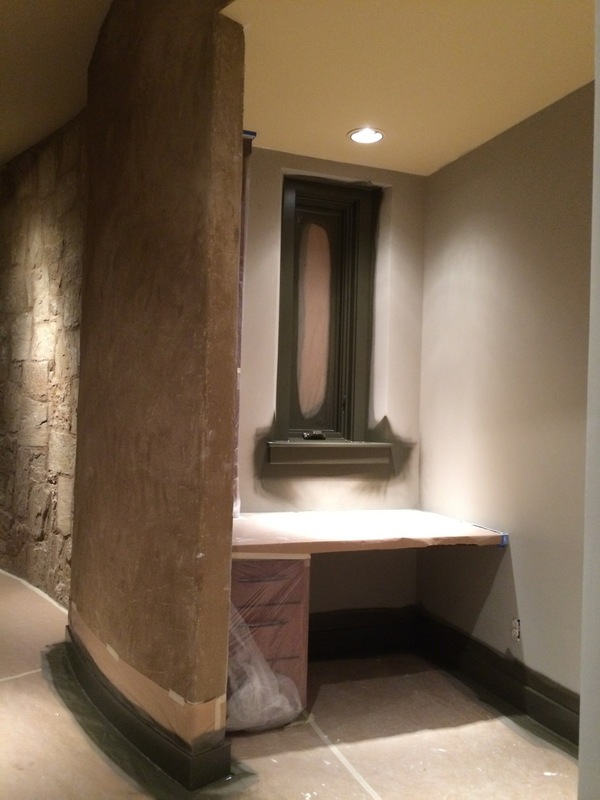 The electricians also installed the lighting in the new Meditation Room. In the photo to the left you can see the actual wall color that has been cut in around the windows. Before the wall painting began today, all the walls were touched up one last time, then spot primed. All the old "Tuscan Stucco" is history. Just because the view out the Kitchen corner window is so pretty, I have included this photo post-prep / pre-enamel. And finally, here are two shots of areas where the painting is complete. I warned the client in advance of posting these that with half the lights burnt out, my camera phone and the paint covered floor drops, the areas seem very dark. But in reality, they are rich and really beautiful. The first is a view into the entrance to the Master Suite and the other a corner in the Master Bedroom. More Friday (in the light of day) as we wrap up the week. I will work to have a lot for you to see since I will be traveling on to other projects next week before returning to Spicewood on March 10th.